Photo above : Zaha Hadid’s One Thousand Museum. By Zaha Hadid. It is a panorama of a young city that lives off ocean and climate, and is connected by cars, and on to which new wealth and new trophies are descending. 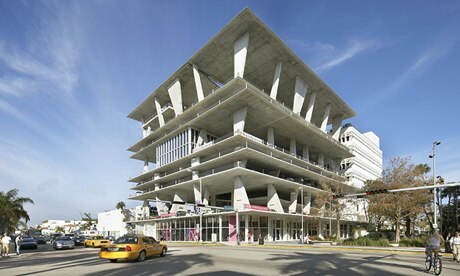 The view is framed by culture, something for which Miami has not previously been famous. It sums up a place that, as property developers, architects and journalists will quickly tell you, is becoming the new Most Exciting City in America. For the way it captures global forces, not always of the nicest sort, and pushes them into local moulds, it is easy to agree. Robert Wennett, a property player who is trying to realise a Rem Koolhaas-designed convention centre, says that Miami was once about one thing at a time – tourism, gambling, retirement – but now is acquiring multiple layers: “You had a place with no culture that was just basically in the sun, but it grows up and becomes a real city.” There is also, he says, a “food craze”, in his opinion the prime index of a city’s buoyancy. The city has become a drop-off point for the migrant tribe of global super-rich, who feel the need to keep homes in London, New York, perhaps Moscow or an Asian city, and now Miami. 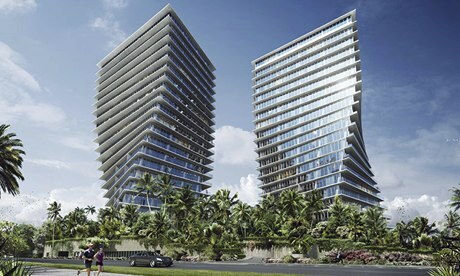 Hence a sprouting of towers and blocks designed by celebrity architects such as Norman Foster, Richard Meier, John Pawson, Herzog and de Meuron, and the Mexican Enrique Norten as well as Zaha Hadid. I am given the sales pitch, which is like going through a car wash on foot, on two twisted towers designed by the Danish whizzkid Bjarke Ingels and his practice BIG. Called Grove at Grand Bay, they include penthouse flats of 11,000 square feet (that’s 10 times the average new three-bedroom home in Britain) selling for more than m. Because it got burned by disappearing buyers during the crisis, the developer Terra asks for a 50% deposit – that’s a lot of money to have in your back pocket, even if the prices are still much lower than equivalent places in London. There is in fact a third way, which is to vanish under the waves. When sea levels rise, Miami, like most of Florida, will be among the first to drown. My guess, however, is that it won’t. Those people who pay m for their apartments will make very sure that something is done to stop their investments washing away.